(Upper panel) A schematic illustration of the infalling gas around the protostar. A disk structure with a radius of about 50 AU exists around the protostar. The disk in turn is surrounded by an envelope of gas extended over a 200 AU scale. OCS exists in the envelope gas, while methyl formate mainly exists in the boundary area between the envelope gas and the disk structure. (Lower left) Intensity distribution of methyl formate (HCOOCH3) observed with ALMA. A structure elongated along A-B can be seen centered on the position of the protostar. Methyl formate is located within 50 AU from the protostar. (Lower right) Intensity distribution of OCS (carbonyl sulfide) observed with ALMA. A structure elongated along A-B can be seen centered on the position of the protostar position, similar to the case of OCS. However the distribution of OCS (~200 AU) is more extended than that of methyl formate. Image courtesy ALMA (ESO/NAOJ/NRAO), Oya et al. Astronomers have long known that organic molecules form in diffuse gas clouds floating between stars. It is thought that as the solar system formed 4.6 billion years ago, some of these organic molecules were transported from interstellar space to the planet forming disk. Later, these molecules played important roles in the chemical evolution resulting in the emergence of life on the Earth. However, it is still unknown what kinds and quantities of organic molecules were actually supplied from interstellar space. Although radio astronomy observations during the last decade showed that saturated complex organic molecules, such as methanol (CH3OH) and methyl formate (HCOOCH3) , exist around solar-type protostars, their distributions were too compact to be resolved with the radio telescopes available at the time. With ALMA, an international team lead by Yoko Oya, a graduate student of Department of Physics, The University of Tokyo, and Nami Sakai, an associate chief scientist of RIKEN, studied the distribution of various organic molecules around a solar-type protostar IRAS 16293-2422A at high spatial resolution. They discovered a ring structure of complex organic molecules around the protostar. The radius of the ring is 50 times wider than the Earth's orbit. This size is comparable to the size of the solar system, and the ring structure most likely represents the boundary region between infalling gas and a rotating disk structure around the protostar. The observations clearly showed the distribution of large organic molecules methyl formate (HCOOCH3) and carbonyl sulfide (OCS). 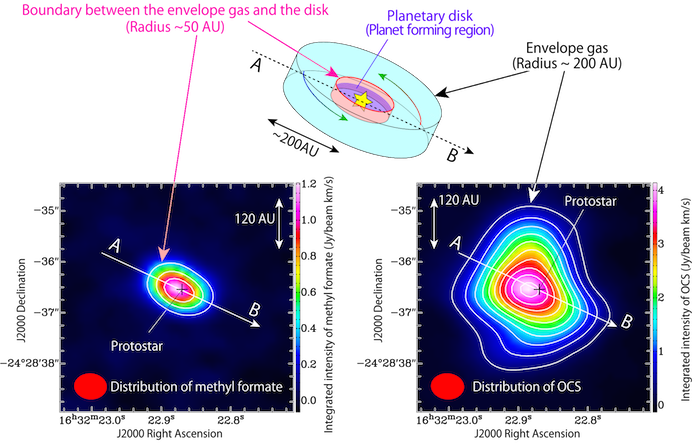 Apparently the distribution of methyl formate is confined in a more compact area around the protostar than the OCS distribution, which mainly traces the infalling gas. "When we measured the motion of the gas containing methyl formate by using the Doppler effect," said Oya "we found a clear rotation motion specific to the ring structure." In this way, they identified the rotating ring structure of methyl formate, although it is not resolved spatially. A similar ring structure is also found for methanol. In 2014, the team found a similar ring structure of SO (sulfur monoxide) around another solar-type protostar L1527. In this source, unsaturated complex organic molecules such as CCH and cyclic-C3H2 are very abundant in the infalling gas, while SO preferentially exists in the boundary between the infalling gas and the disk structure. Although the physical structure in L1527 is similar to that found in IRAS 16293-2422A, the chemical composition is much different. Saturated complex organic molecules are almost completely absent in L1527. The present result, taken together with previous results on L1527, clearly demonstrates for the first time that the materials delivered to a planetary system differ from star to star. A new perspective on chemical composition is thus indispensable for a thorough understanding of the origin of the solar system and the origin of life on the Earth.